The CareGiver Partnership: Emergency Response System Works In The Home…And Away. Emergency Response System Works In The Home…And Away. Seniors want their independence, and yet their caregivers and loved ones are concerned that if they live alone and an emergency occurs it may have tragic results. Thus, many companies have come up with tools to help elderly live independently and still have access to emergency help should an emergency situation arise. Emergency response systems are designed to alert authorities in case of an emergency. In general the senior will have a device that they will use to call for help, either with a push of a button, or some other means. When activated, the device may send a call directly to 911, call a caregiver, alert a third party system operator that would then check in and send needed help, etc. Not all emergency response systems are created equally. While every emergency response system is designed to do basically the same thing, provide emergency help to a senior in need, not all of them are equal. Most only work inside the home, around the base station. Lifeline is an excellent example of this. While it offers many benefits such as being waterproof (thus the senior can wear it in the shower), it only works in the home. This greatly limits the usefulness to a senior with an active life outside their home. It is a fully functional cell phone, but is designed to be easy to use for seniors. 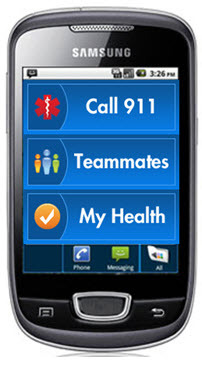 It comes with pre-pgrogrammed features, and large call buttons for 911 access, as well as caregiver access. It is intuitive, making it as simple to use as a pendant call button, but sophisticated enough that it does so much more than just call for emergency help. In addition, because it is a cell phone, it works anywhere a cell phone works, giving it far greater range of usefulness then a pendant emergency response system. Check-in software. Caregivers often worry about their loved ones, but don’t have the time, ability, or desire to continuously stop in, or nag them. My Health Phone can be set up to make regular check in contact to insure the senior is okay, and not simply unable to reach their device. This check-in can be made via text, email, or a phone call. Caregiver assistance and confirmation. This emergency response device is not just for the senior, but the caregiver as well. When a senior checks in, the caregiver can opt to be notified. When they take their medications or respond to a medication reminder, the caregiver can opt to be notified. If the emergency response system is used, the caregiver will be notified. This helps them to worry less, and nag less, and rest assured that their senior loved one is okay. Provides access to important documents and information. If a senior were to slip at a grocery store, and emergency personnel were to treat them there, chances are they would not have documents like their living will, medical directives, or HIPAA with them. My Health Phone service includes complimentary service with Proximiti’s My Internet Lockbox service, which electronically stores copies of these important documents so that they can be accessed in emergency situations regardless of where you are, even when traveling. As you can see, this is far more than an emergency response system, it is an independence tool, a way to provide greater peace of mind to caregivers and seniors alike. It is the Swiss army knife of emergency response systems.